By nature of the profession and the work that we do as nurses, doctors, or other medical staff, we are routinely exposed to the sick, the dying, the tragic accident, the miracles of medicine, the joy of cures. Also by nature of our profession, I see on a daily basis the organic reasons for life, the physiology behind somebody healing from an illness, how medicine works on a human body to fix their ailments. On the other hand, I also see what goes wrong and I see when a body’s organs fail to function properly and what the end result is. When we have a death at the hospital, a common question that floats around the nursing staff is “what happened” or “why did they die?” Although there is oftentimes a medical “reason” for such travesty, do we ever really know why? I was raised in a Christian household and taught that God has the ultimate control over our lives. I pray every night before I go to sleep for the health and happiness of my family and friends. Fortunately, in my own life, aside from aging grandparents, my family and friends have led relatively healthy lives- and I thank God for that. But I’m certain that families of children at the hospital have also prayed every night for God’s healing hands to help their dying child. 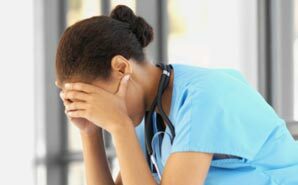 As a nurse (and as a believer in God) one of the greatest struggles to overcome is that three letter word, why. Why would God take the life of an innocent child? Why would He heal this child but allow the one next door to suffer? Why would He put such a wonderful family through so much turmoil? One of my very first posts on this blog was about a boy whom I referred to as Frog Boy. He was a patient at our hospital that I met the previous year at a summer camp, and we grew extremely close to one another during his months spent in the hospital awaiting a heart transplant. Five days after his ninth birthday he died suddenly one evening from a “silent” coronary event. His current heart was a transplanted heart back from when he was just over a year old and because during transplantation you lack innervation to the new heart, these children oftentimes do not have warning signs of a heart attack like the average person would have. Along with being completely devastated by his death and angry that I was not there to be with him, for months as other kids were getting their transplants my prior-to-bed prayers were spent questioning why that beloved child was not given more of a chance. I hit a low at work after his death. I felt burnt out, angry, sad and most dramatically directed this frustration at God. I would watch the news at home and see criminals surviving police chases, murderers getting acquitted of their crimes, people on a daily basis breaking into homes and robbing people at gunpoint. Why did these people live and such a vibrant child with so much life ahead of him have to die? How could God do that to his family, his siblings, and selfishly, me? Then one day it hit me. Everyone’s time spent here on earth has a meaning and a role that they play in life. For some, it takes a lifetime well into adulthood to figure out that meaning or to fulfill it. For others, they are so wise beyond their years and have such an impact on those surrounding them that they only need a short time. That young boy, even at the ripe young age of 9, touched so many lives in his short lifetime because of his huge heart, even though it was sick. He brought smiles to those that needed some sunshine, and he brought optimism to those that didn’t think they could go on. He was a child basically locked up in the hospital attached to an IV pole, and he had a better spirit than most people I know. Perhaps he knew his time was limited, that’s one thing that I will be sure to ask him when I see him in heaven. All I know is that I am a better person today because of him, and his life and subsequent death has taught me that even amidst tragedy we must remember life and not dwell on the why. I know he is happily acting as my guardian angel and looking over the child that got the heart that he was waiting for. God knew he was special and thought he could continue doing all of his good from heaven. Since then, when deaths have occurred, no matter what age or circumstance, I have not turned away from God, but instead turned to him, and thanked him for the time he allowed me spend with that person here on earth. I used to once be afraid that I would never care for another patient again for fear of losing them unfairly. But like I said in my past post to that fine young boy, I’d rather love a patient like you and lose you than never love at all.